Two Bears Farm and the Three Cubs: Red and Yellow together do not make more Red. Red and Yellow together do not make more Red. I was kind of surprised that even though we've read this book many times, even though Pierce has known his colors for years, he still doesn't seem to get the whole mixing colors thing. 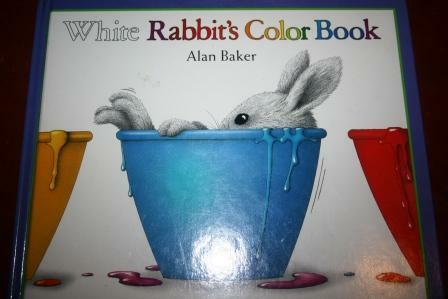 So we decided to do a special focus on White Rabbit's Color Book, by Alan Baker. In the book, white Rabbit jumps into different colors of paint, and as the colors mix Rabbit turns into green, purple, orange and brown. 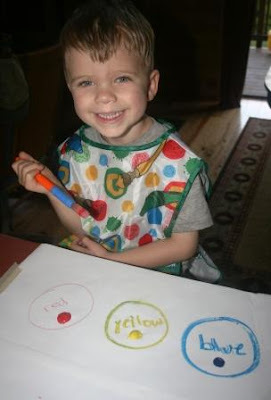 Then, we mixed colors ourselves to see what would happen. We got the same results as white Rabbit. Mix in saucepan over medium heat 4 minutes or until it looks exactly like mashed potatoes. Turn out and cover with damp cloth until cool. Pierce kneaded the clay and then cut out some white rabbits. I think I may have a cookie cutter addiction issue. And I even already gave a bunch away to my sister-in-law. We let the rabbits Pierce cut dry overnight. 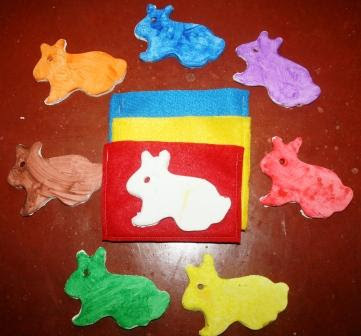 Then we painted them colors, and I made felt pouches to represent the paint cans. Pierce is able to dip the rabbits in and out of the pouches to get the different colors of Rabbit. An intensive project, but Pierce really loved working with the clay. 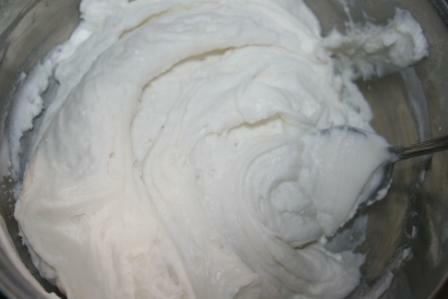 We had plenty left over, and it can be stored in an airtight container. 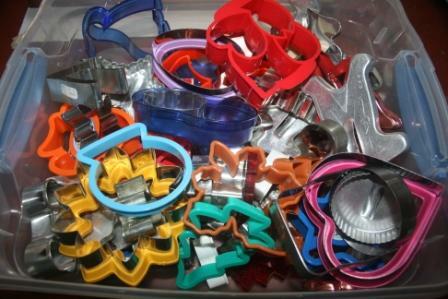 Wooow, so much cookie cutters!! I love them. Unfortunately, here in my country you can't buy many different kinds.. I love the pouches and the rabbits. The book is cute too. You really know how to have fun! Awesome! Your house is so fun!! I never seen this book! Cute extensions. What a great activity! I am going to do this and thanks for the idea!! You do so many fun activities with your boys! Looks like Pierce had a lot of fun with this one! What a great little unit study. And that was one of our favorite books when my kids were younger! Thanks for bringing back such great memories. What a great project! I will have to remember this book next time I need a baby gift. These projects look like they were fun as well as educational. And I think I have that exact same rabbit cookie cutter! He is just adorable. That smile of his always puts a smile on my face. Can I come over to play? This looks like so much fun. My daughter bought Ben some Color Bath Dropz from Walmart.. they are fragrance free water-coloring tablets. They are all the primary colors and drop them into the tub filled with water combine colors to create cool, new seccondary colors.. They don't stain the skin and Ben just loves them. When my kids were little (a long time ago) I would make this for them.. Oh such fun they had with rolling it out and cutting with cookie cutters. making messes. a perfect little boy day! I hope you realize I'm going to be playing with clay when Michael comes home from work. I'm blaming you! So fun! 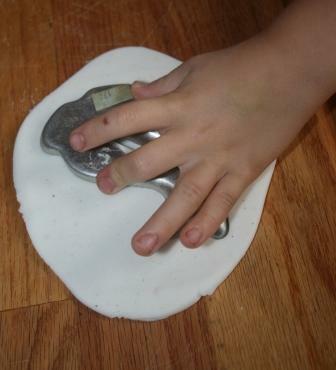 I've made play dough, but never homemade clay. I'll have to try it out. I'm probably too lazy to make the pouches, but I love the idea. This is such a fabulous idea! We've never read this story and it looks like so much fun! I just wrote down the book so I can check it out at the library. Thanks for sharing this! What a good idea to reinforce the concept of mixing colours. I think I'll try this with JBird. What fun projets! That's great that you went a step further by doing something hands on to help him understand. I may have to look for that book for Hailey. Can I send my kids to your house to play? They would have more fun there than here right now! lol You are doing all the cool stuff and I'm trying to get mine to clean up their messes in the living room. Legos are everywhere. School supplies are all over my dining room table right now too. We love Alan Baker books but haven't read that one. Great project with rabbits. Intense, as you said, but fun! I also love cookie cutters! now my 2 boys are...in their late 20's...thanks for the memories! This is a very cool project, and I love the dough, because it's made from safe stuff! I may make it with the girls! Do you store it out of the fridge, and how long will it keep? It seems like Pierce has a blast with you all the time!! I really love that book, and I love your project too. It might have taken a while, but it was so great!!! We borrowed that book from the library awhile ago and the kids loved it! 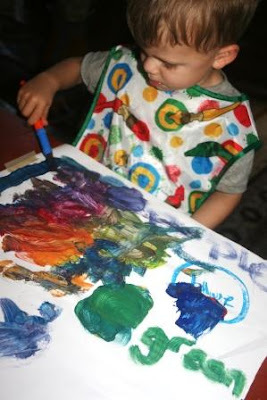 I never thought to do a craft along with it to help cement the idea of mixing colors....you are one creative Mom!!!! I may borrow that clay idea! 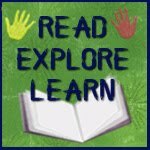 that's a cute book and fun activity!